I was touched and flattered to find myself recruited to the ranks of nature writers by their dean, Richard Mabey, in his defence of their genre against an attack by Steven Poole. Poole’s phrases “recent nature writing” and “nature writers” amount to an indiscriminate homogenisation; current nature writing is the broadest of secular churches. 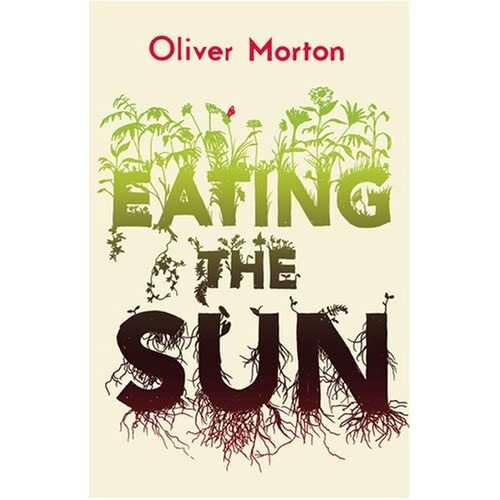 Oliver Morton’s engaging personal saunter through the world of photosynthesis, Eating the Sun, for example, might be more properly labelled imaginative science writing, just as Robert Macfarlane‘s literal wanderings in his masterpiece The Old Ways is really imaginative travel literature. Quite how well I fit there, though, I don’t know. 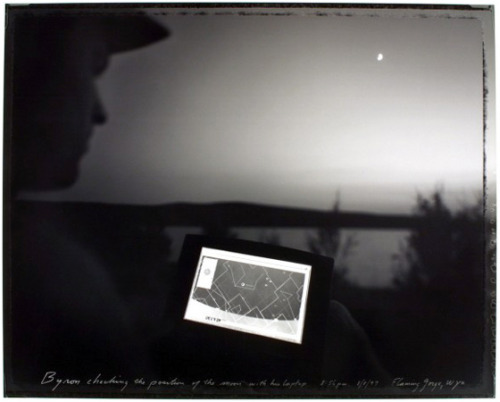 I was thinking of exploring the matter in a blog post, but then realised that to quite a large extent I have already done so on this very blog, responding to a 2007 piece by MacFarlane that talks about the essence of nature writing. Eating the Sun is definitely “in search of some version of ‘nature’”, and it is more of a first-person narrative than I necessarily expected it to be. But it does not share “a passionate engagement with ‘the land’”. Indeed rather the reverse. One of its original aims, which I think is probably fulfilled to some extent, but perhaps not as explicitly as it might have been, was to celebrate air as the basis of life — which it is for plants and thus, indirectly, for us. One aspect of this is to encourage an appreciation that the air is universal where the land is particular — the carbon taken in by trees in Brazil has come in part from your lungs and mine, the carbon taken in by the rose on my terrace has come from all the lungs of the world, not to mention coals that have sat buried for a million centuries. One of my reasons for writing about photosyntheses was specifically this — that it was a way to talk about the living earth that did not have to be a way of talking about specific places (though there are specific places in the book, some of which I love deeply). I find ideologies of land and rootedness worrying intellectually and hard to partake in emotionally; I suspect them of being innately regressive and conservative. One of the great opportunities of the current carbon/climate crisis is to create what might be called an ideology of air — of valuing and caring for something common to all and intrinsically global, and of creating a passionate engagement with the open sky and the endless sun. That still holds pretty true, and I am struck, re-reading it, by how well the ideology-of-air stuff at the end sits remarkably with my current conception of what the geoengineering book needs to do. I am not as sensitive as I might be to the subtleties of place. I lack a capacity for the sure recognition and the ready retention of names and distinctive detail. Learning to parse the shapes of leaves or the textures of rocks does not come easily to me, and I have never lived long enough in a non-urban landscape for such things to have seeped in through the capillaries of unattended observation. Given all this, the belief that life’s nature needs to be captured at the levels of the molecule and the planet—at levels perceived by the intellect and not the senses—provides me with some succour. It is far more abstracted than traditional ways of feeling close to nature; it is argued more than absorbed. Yet though it doesn’t grow out of the experience of life in the world, I find that it still serves to enrich that experience and to render it more profound. It ties the sky to the seed and the rain to the rock in a way the details of rustic experience cannot. I can see that there is something sad about a oneness with the world that can be felt as easily—sometimes more easily—from the window seat of an hermetically sealed and environmentally damaging passenger jet than when sitting on a riverbank and picking out the trout swimming upstream. But for all that this belief is a creature of the mind, rather than a sentiment grounded in birdsong and summer scents, it has meaning to me that I cannot reduce to analysis and it has the power to move me. And I think it can enhance more traditional forms of empathy with nature. It enriches the way I see trees on a scarp, or grass in the wind, or moss on a cliff, or a star in the sky, even though I can rarely recognise the species, rocks or constellations I may be looking at. A sense of planet can amplify a sense of place. So I am not entirely sure I really belong there — but I am more than happy to be included in Mabey’s broad church, and flattered to be singled out. As long as no one minds that I don’t know the scriptures or when to genuflect. PS — there’s more along this line in the “Nature writing” category on this blog, including, as it happens, previous posts inspired by Steven Poole and Richard Mabey. I’m fascinated by the fact the Earth-system is a massive conduit of power, with energy flowing into the system in the form of sunlight, flowing out of it as infrared. The flow involved is simply extraordinary: 120,000 terawatts. That’s 10,000 times the amount that flows through our industrial civilisation – all the world’s reactors, turbines, cars, furnaces, boilers, generators and so on put together. Yet so firmly are we tethered, and so smooth is the flow, that we hardly notice this torrent thundering past and through us. It just feels like the world. So here’s an image to try and capture the immensity of the flow in which we are embedded. Picture Horseshoe Falls, the most familiar, forceful and dramatic cataract in Niagara Falls, in full spate. Now increase the height of the falls by a factor of 20; a kilometre of falling water, a cascade higher even than Angel Falls in Venezuela. Now increase the flow by a factor of 10. Instead of 30 tonnes of water falling over each metre of the lip of the falls every second, allow 300 tonnes of water per metre. Finally, widen the falls. Stretch them until they span a continent, with billions of tonnes of water falling over them every second. And don’t stop there. Go on widening them until they stretch all around the equator: a kilometre-high wall of water thundering down incessantly, cutting the world in half, deafening leviathan in the abyss. That is what 120,000 terawatts looks like. That is what drives the world in which you live. The Economist has an occasional column called Green View which looks at all sorts of environmental issues, though with a preponderance of climate stuff: in the past few months we’ve looked at arctic ice, business and biodiversity, tuna farming, Svalbard (of course), Climategate, malaria and climate change, the Hartwell paper, future urbanisation and a bunch of other stuff. Since I’m the Energy and Environment Editor I sort of own this slot, though I don’t write every one of the pieces that goes in. And since there’s a lot less blogging around these parts than there used used to be, I thought some of you might like to know this. The Earth is a recycling scheme that has been running for a third of the age of the universe. Microbes and plants endlessly pull carbon, nitrogen and oxygen from the atmosphere and pump them back out in different forms. 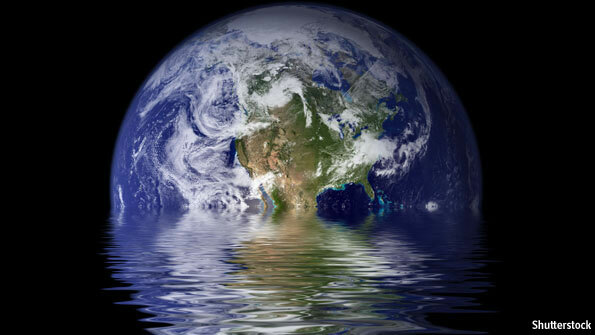 Water evaporates from the oceans, rains down on the land, pours back to the seas. As it does so it washes away whole mountain ranges—which then rise again from sea-floor sediments when oceans squeeze themselves shut. As oceans reopen new crust is pulled forth from volcanoes; old crust is destroyed as tectonic plates return to the depths from which those volcanoes ultimately draw their fire. 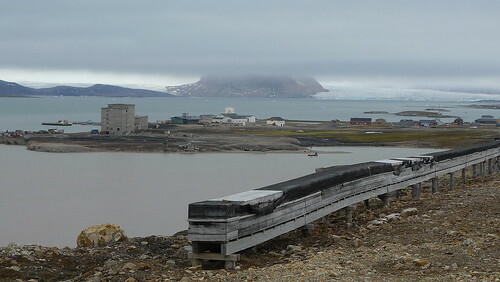 I’ve just been up to Svalbard, in the high arctic, for a symposium on climate change. Here are some excerpts from a correspondent’s diary over at The Economist. 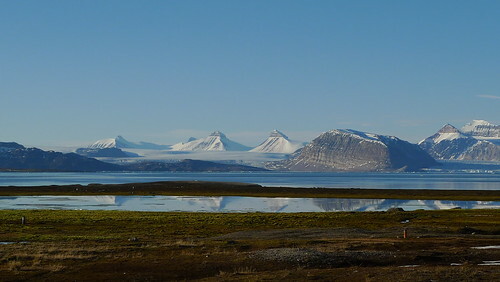 …In the late afternoon (sun west by southwest, over the airstrip) the symposium took to the water, heading to the top of the fjord to look at the glaciers under clearing skies. Bijou icebergs floated almost stationary in the still water. A flock of kittiwakes, startled, flashed up from their station at the point where meltwater and seawater meet. Scientists talked of kelp and copepods. The ice at the end of the Kongsfjord towered above us. But less so than once it would have. 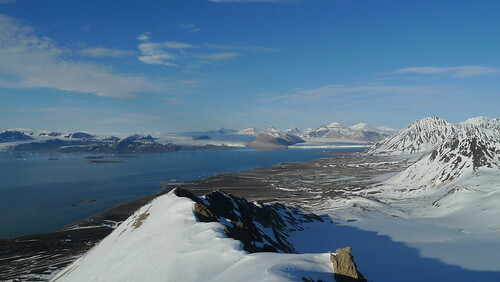 Many of the other glaciers no longer reach the sea, retreating to their mountain lairs, folded moraines left behind them. 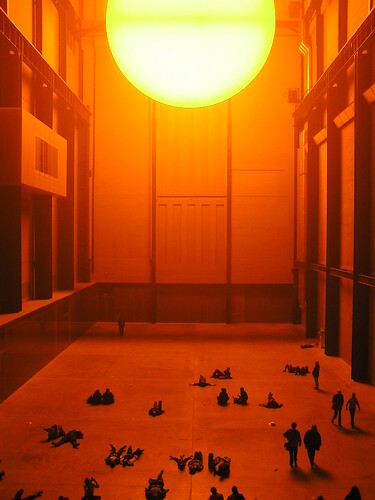 The turbine hall of Tate Modern is a vast space, and much of the art that has been shown in it over the past ten years has failed in the face of its immensity; little things were daunted by it, big things cluttering it up to ill effect. 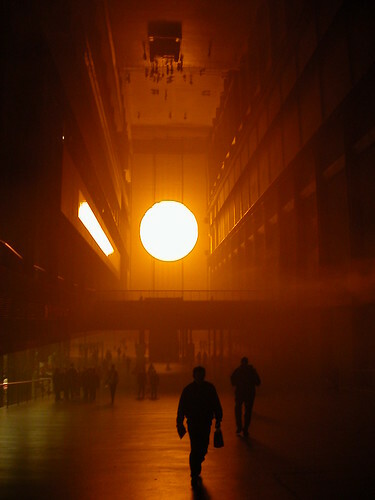 Olafur Eliasson’s work, though, brought the sublime to it. Undaunted by the huge volume, Eliasson effectively doubled it by mirroring the ceiling, making a spaceship hold large enough for other spaceships to chase through. And within that space, he recreated the sun, encapsulated and encompassed in an idea of art. To quote Edmund Burke again — “Such a light as that of the sun, immediately exerted on the eye, as it overpowers the sense, is a very great idea”. Throughout the hall, 200 metres long, people stared at something more vast than they were used to indoors, more present than they were used to outdoors, an idea that was also an experience. And when they looked up – or lay down, as we did, in large numbers, unbidden – they saw themselves, in the mirrored ceiling, clearly down on the floor, and clearly high above the sun in which they basked. It was a shrunken world, but not a constraining one. For an experience of the sublime, it was unusual in many ways. One was that it was enclosed, not open. The great electric architecture of the building itself stood in for our power to encompass anything – even the weather, even the sun – with our minds. And that made it reflexive, too. To experience it was to see not just the sun, but to see yourself in the sun, seeing the sun. And not just yourself. Because another oddity was the sense of solar solidarity. Mostly, in facing the sublime, one is alone – that is, in fact, the point. The weather project didn’t allow solitude. You, anyone you were with, anyone else who was there, were all in it together – down on the roof, up in the mirrors, flanking the sun. It was a sublime with a sense of the personal – and the collective. As such, it was an inspiration. UPDATE: Looking at this post I realise that out of context it is pretty much impenetrable. The idea was to try and find an image for what the sort of solidarity that might make geoengineering governable might actually feel like. — Jean Baudrillard, quoted by Steven Poole. It struck me reading Poole’s review that an awful lot of the concerns in my writing, most recently in “Globe and Sphere, Cycles and Flows: How to See the World”, which is my essay in the Royal Society collection, Seeing Further, sit firmly in the space defined by those two quotations, the second one of which is the epigraph for Mapping Mars. The ability to see the Earth as an astronomer would another planet marked a fundamental shift, the long-term effects of which we still cannot gauge. It has provided valuable new perspectives and treasure troves of data. But no image can reveal everything; and every revelation obscures something. For all that it is an image of the whole, the vision of the Earth from space is necessarily partial. By leaving things out, it makes the Earth too easy to objectify, too easy to hold at a distance, too easy to idealise. It needs to be offset by a deeper sense of the world as it is felt from the inside, and as it extends out of view into past and future. Because of the changes we are putting the planet through, we need as many ways of looking at and thinking about it as we can ﬁnd. We need ways to see it as a history, a system, and a set of choices, not just a thing of beauty – one which, from our astronomical perspective, we seem already to have left. There are other ways to see the beauty of the world than in the rear-view mirror of progress. How better, though, can people see the world than as a fragile blue marble separated from their own experience, cut off from any cosmic continuity by a sharp 360º horizon? And why, given the objective truth of the world as revealed by Apollo, should we even try? To the second question, the answer is that there is more than one way of seeing, just as there is more than one way of speaking. There are times when seeing the Earth as a discrete object, a thing in a picture, is peculiarly helpful; there are times when something else is called for. Not to be a tease, but if you want to get an answer to the first question you better get your hands on a copy of the book (Amazon UK), though it must be said that some of the ideas were worked through in a rather different way in my Earthrise piece a couple of years back. I should have mentioned this before (self promotion FAIL) but in early August Eating the Sun finally became available in paperback (Amazon UK for £6.99, or any other vendor you choose). New cover goes for a slightly Richard-Mabey-ish vibe, which is probably a good idea; as I’ve said before, the book does have stuff to offer people in the nature writing tradition. That said, the way the word “Sun” ends up as subterranean in this cover treatment does seem a little odd to me. US paperback (with yet another cover) to follow later this fall. This is a book about “the most important process on the planet”: photosynthesis. Plants grow by “eating the sun”, trapping its energy and using hydrogen from water and carbon from air to produce flowers, fruit and seeds. The “scrap of sunlight” converted into organic matter by the world’s plants each day is equivalent to the energy in the global arsenal of nuclear weapons. But, by releasing the energy locked away some 300m years ago in fossil fuels, we have upset the delicate balance of the carbon cycle and made “the atmosphere itself as artificial as a Capability Brown landscape”. From molecules to the planetary scale, Morton’s beautifully written book reveals how life is made from light. The living landscapes we inhabit are shaped by photosynthesis, and Morton’s sense of wonder at the pervasive influence of this process is nowhere stronger than while walking across the South Downs near his home: “It’s grassland like this, more than any other habitat, that gives us both homes and horizons.” A rich and wide-ranging study. Having taken these words from The Guardian, I should point out as they would that you can buy the book through their bookshop at the RRP of £9.99, if you like.